And so, in the magnificent shadow of Edinburgh Castle as the first breaths of autumn blow through the streets, Arcade Fire bid adieu to The Suburbs on British shores. For such a confessed anglophile band, the 13 months since they first showcased the newly birthed album with an astounding headline performance at Leeds/Reading must have been intensely satisfying. When they last tentatively graced arenas in 2007, it seemed somewhat hesitant. They didn’t have the quantity of songs to fully acquit themselves in that setting and despite the performances being mighty, you got the impression they where punching slightly above their weight, albeit with a challenger’s pluck and hunger. Fast forward to 2011 and these two huge shows: (Manchester last night, Edinburgh tonight), following swiftly on from their sell-out Hyde Park gig seem to serve as a celebration of how far they’ve come. From beloved underdogs to genuine A-Listers; from cult awards to Grammy winners, The Suburbs has elevated Arcade Fire to a more exalted pantheon. Not that you’d be aware of any laurel resting from the manner they tear the head off opener ‘Ready to Start’ tonight. Arcade Fire have always walked a narrow high-wire between beauty and fury and they’re clearly in no mood to relinquish this position anytime soon. ‘Keep the Car Running’ and ‘No Cars Go’ (both nonchalantly dispatched early on) show that although 2007’s Neon Bible doesn’t quite match up to the calibre of its preceding and succeeding records, its best moments remain glorious (as proved further by a stunning ‘Intervention’ not long in following). What has become clear over the past year is that as the band’s confidence in their new material has increased, as the crowd response to it has grown more rapturous, they’ve become bolder and braver with the material - playing it with a swagger rather than a shudder. Nowhere is this more apparent than in Régine's vocals. At Leeds and Manchester Central last year, she was notably struggling to hit the high notes on ‘Sprawl II (Mountains Beyond Mountains)’ whereas now, she tears into it with confidence and precision, meaning that the one album track they previously struggled to equal live is now another devastating weapon. The one track that will most likely be pruned following this round of concerts is ‘Rococo’: already the weakest of The Suburbs tracks and one into which, despite their best efforts, they simply can’t inject enough energy to prevent the momentum drifting away. Any malaise is instantly curtailed however by the appearance of ‘Wake Up’ midway through the set. In a sense, it shouldn’t be too much of a shock (they played it second at their Hyde Park show and have been shuffling it round the set all summer) but the offhand delivery of perhaps their finest anthem proves to have exactly the desired effect. Instantly the whole crowd is in tumultuous uproar: fists beating the air, eyes closed, lungs being emptied with abandon. From one perspective, you can understand why Arcade Fire don’t want to have the song pigeonholed as their “showstopper ending” and from another, it provides the ideal accelerant to lift the flames and atmosphere midway through. And now, they have enough torch songs to take its place without compromising quality. From that moment on, the whole performance soars. Gloriously and effortlessly soars through the Edinburgh night. It’s your typical ‘spectacular without resorting to unnecessary excess’ Arcade Fire show tonight. They still swap instruments round like passes in the Barcelona midfield; they still beat all sorts of percussion: random drums, crash helmets, guitars…whatever they lay their hands on. Régine still does that glorious little dance to ‘Haiti’, as well as trailing burlesque streamers around her flowing white dress. And more so than ever before, Win Butler looks less like a man who has just been dragged from his bed and thrown, tired and angry onto a stage and more like a genuine frontman. He’s never going to be Freddie Mercury but he’s now become someone you can genuinely warm to. Musically, they are as brilliantly tight and effective as ever, most notably in the way they link the songs together (despite the instrument swapping, seldom does the stage fall silent. It’s amazing how effective this is in creating a genuine flow and momentum to their live show). In short, in an era when it has become very easy to cover up live inadequacies with strobes, video screen and absurd puff-flash-bang stage theatrics, Arcade Fire still take it back and deliver a great show by being…well, simply great musicians. There’s no secret formula to Arcade Fire and there is nothing particularly complicated about what they do. They just do it extraordinarily well, with a genuine, overwhelming and infectious passion. It’s all with the tide in the second half; the battle is fought and won. ‘Laika’ still sounds as mysteriously wonderful as it did when it first emerged in 2004 and the juxtaposition of ‘The Suburbs’ misleading sweetness with the juggernaut-collision of ‘Month of May’ is stunningly, viscerally effective. By now, Win is smiling broadly between songs, thanking the crowd profusely and whole band resemble children on Christmas morning; it is a wonderful sight to behold. And they go on and on. ‘Tunnels’ remains one of the most devastatingly powerful songs in recent years and the aforementioned ‘Sprawl II’ and ‘We Used to Wait’ are already greeted as classics. Returning for a rapturously received encore, the kinetic broadside of ‘Power Out’ prompts another crowd explosion, before threatening to peter out into collapsing chaos at the end. But before your eyes and ears, it suddenly pivots jaw-droppingly to segue into a spectacular 'Rebellion (Lies)', a communal moment of jubilation to close proceedings; the band bowing as they leave the stage, the song’s closing melody being sung continuously as we file out along the Royal Mile. There’s a sense of triumph in the air. 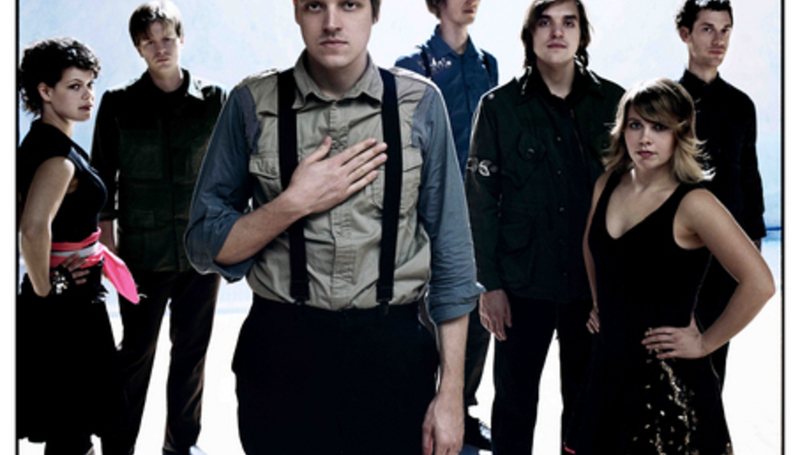 No longer can Arcade Fire be considered a cult band, they’re much too big for that now. But more than any major act in the past 10 years, they have kept their intrigue, mystique, charm and beauty while gradually added more and more devotees to their ranks. This is a band that mean something to so many people; this is a band who can covert the Pitchfork Media and the Heat Magazine reader alike. Whatever they choose to do next, they’ve achieved a level of commercial and critical respect that very few bands ever manage in a lifetime. And whether you like them or not, it’s difficult not to be astonished that a bunch of curious, mismatched outsiders can emerge from nowhere to arrive at this position. This time, there is a happy ending. This time, the good guys won.